Dr. Serkan ANILIR is a Ph. D. in Engineering, and now an Assistant Professor at Department of Architecture, Graduate School of Engineering, the University of Tokyo. He is widely known as a multi-talented genius among Japanese and Turkish people; it is supposed that he is a former member of Turkish national ski team, a cosmological physicist, the first Turkish NASA astronaut candidate, an engineering scientist on space architecture, among others. He has published 3 popular books in Japanese, and is giving lectures frequently for general public. However, recently, serious doubt has been raised on many important aspects of his proclaimed career and achievements. In several postings, we will discuss these issues. If you are a newcomer to this blog and would like to learn quickly about the problem, please check the "Suggested Important Readings" on the right panel. Mr. 11jigen (meaning 11 dimensions), the owner of Japanese blog, has finally sent out an official accusation (in Japanese) on massive plagiarisms in Dr. Anilir's Ph. D. thesis. He even attached over 70 printed reference materials (mostly plagiarized sources). The accusation was cosigned by Mr. 781, who had earlier sent an accusation on Dr. Anilir's use of research grant. At this moment, 59%(!!) of the thesis is identified as plagiarisms. It was received by the University of Tokyo administration on November 30th. Great Job, Mr. 11jigen! Many other people also contributed to the investigation of Dr. Anilir's thesis. I just found out that two e-mails, which I received weeks ago, were erroneously filtered into the spam folder. I was completely unaware of this. The messages in the spam folder are deleted after 30 days, so it is possible that some messages were sent to the spam folder and later deleted without my knowing. I am sorry if this happened to you. If you sent me an e-mail more than 30 days ago, but never received my reply, please let me know. His Japanese blog remains silent after September 26th, although he used to post at least one entry every month until September. How was this investigation started? This entry perhaps should have been posted first. I apologize for posting this late. A frequently asked question about the recent investigation of Dr. Anilir's career is how it was started and spread recently, after the negligence over several years. Some people suspect (or try to downplay our effort by claiming) that it must come from personal resentment, which is completely wrong as you will understand by reading the following. It seems that some people had suspicion about Dr. Anilir before. However, if you do not have a solid evidence, it would be difficult to accuse someone. It also involves certain risk. Dr. Anilir was fairly well known, but he was not famous enough. Many people had not (and perhaps still have not) heard about him. Things might have changed a little, when an article featuring Dr. Anilir appeared as one of the "Front Runner" special series article in Asahi Shimbun (newspaper) on August 29th, 2009. Asahi is one of the largest newspapers in Japan (officially, 8 million copies are printed for every issue), and it featured him in substantial depth (full 1 and 1/2 page) -- although most of the content now seems to be fantasy. The "Front Runner" series featured, for example, Bill Gates in the past. Maybe he got more attention because of this article in Asahi Shimbun. On the other hand, although it is overlooked by traditional media, some serious (and often very professional) discussions also take place in "2 channel". It has many sub-forums (called ita or "boards" in "2 channel"), and several of them are devoted to sciences. On the "Sciences - General" board, there was a thread on paper submission, where people were discussing how to write a paper and go through the review process, etc. Meanwhile, someone got to know about Dr. Anilir (maybe from the Asahi article, but I don't know) and looked at his publication list in his web page at the University of Tokyo. At a glance, it looked like a normal publication list with many papers. But he or she noticed that there was a very strange "paper" in the listing -- Physical Review Letters published by Cambridge University Press, and the article is claimed to have more than 10 pages. Anyone with some research experience in physics would immediately smell something strange. I am not sure if anybody with physics background looked at the publication list previously in Japan. Maybe someone noticed, but did not know how to deal with it. Actually, we learned that "feyerabend" (who I think also contributes to this blog) did notice the problem with PRL (and some others) and posted to Turkish internet forum(?) "sourtimes" earlier, on May 18th, 2009. Maybe our "2 channel" just has more population to start a large-scale movement. 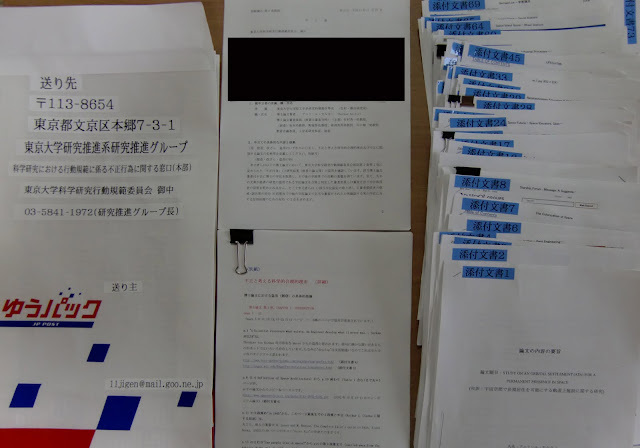 Anyway, in Japan, the person who noticed the problem with "Physical Review Letters" paper posted the finding to the thread discussing paper submission, in "Sciences - General" board of "2 channel". It was on September 5th, 2009, just one week after the article in Asahi Shimbun. It got attention of scientists participating in the same thread, and on September 9th, a new thread to discuss exclusively the "Serkan affair" was started. The story was spread gradually over "2 channel" (especially science-related boards) and attracted quite a few scientists and engineers. I am just one of them. Later, the information was spread not only in "2 channel" but also through other internet media. Investigation was also extended in other places, in particular at Japanese blog where the findings of "2 channel" are also summarized. This is also an interesting subject in the history of this affair, but let me stop here for now. I just mention that the "Serkan affair thread" in "2 channel" is now 10th in its series. Every thread is closed after 1,000 postings, so there have been almost 10,000 postings in the "Serkan affair thread" so far. Anyhow, the current investigation was ignited by the anonymous posting in "2 channel" on September 5th. Most of the people involved in the investigation, including myself, did not know about Dr. Anilir before that epoch-making posting, so there was not even a chance to have any personal resentment. It is also interesting to recall that "2 channel" is often regarded as a crazy, underground place, especially by traditional media. At least concerning Dr. Anilir, however, it quickly accumulated most precise information which was not known by newspapers or authorities like the University of Tokyo. Some people are worrying (or hoping?) if he is still enjoying the same life as before. Of course, as the problem is getting attention of more people, many of his activities have been canceled or affected significantly. Some update since the last report. ・Toshiba Elevator Corp. "Future Elevator Contest": Dr. Anilir was listed as a judge, but removed from the web page on Nov. 16, 2009 without any explanation. ・"Serkan College": apparently kicked out from the original Tokyo venue in "Midtown Tokyo". On the web, they announce that "The location will be notified to each participant in private". "Liaison Center" used to be a co-organizer, but has dropped out. We learned that many participants are now aware of the problem and demanding an explanation from the organizer. One of the true statements (which are rare!) appearing in Dr. Anilir's CV is "Ph. D. in Engineering" from the University of Tokyo, obtained in 2003. We wonder what would be the percentage of his contribution in the end?? Even we forget about "NASA Astronaut Candidate" and all other problems, the Ph. D. thesis alone seems to be a quite serious problem.